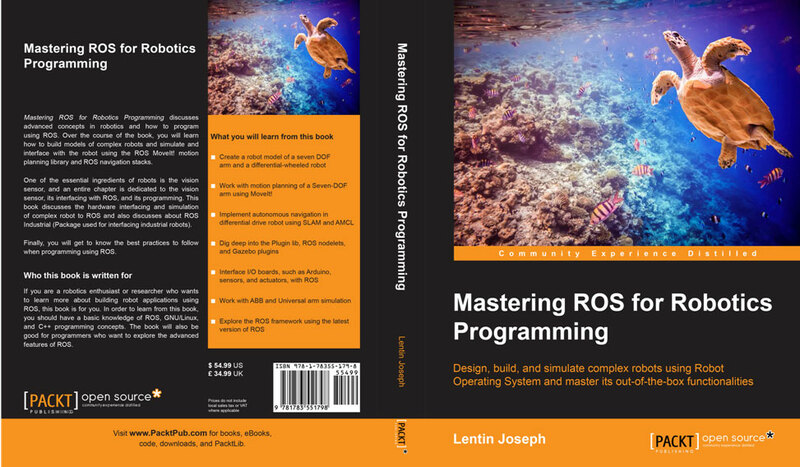 A new book by Lentin Joseph, Mastering ROS for Robotics Programming, discusses advanced concepts in robotics and how to implement them using ROS. Readers will learn how to build models of complex robots, and how to simulate and interface their robots using the ROS MoveIt! and the ROS navigation stack. Just released this past December, this 481-page book is one of the most advanced books on ROS currently available. Joseph is the CEO/Founder of Qbotics Labs, and the author of Learning Robotics using Python. This book begins with a deep overview of the ROS framework, discusses robot manipulation and navigation, and covers how ROS interfaces with I/O boards, sensors, and actuators. Vision sensors are essential ingredients in robotics, and so an entire chapter is dedicated to how they interface with ROS. The book also explores hardware interfacing and the simulation of complex robots in ROS and ROS Industrial, and finishes with a chapter on best practices to follow while programming in ROS. Exploring the advanced capabilities of ROS MoveIt! The book is published by PACKT and can be purchased at Amazon Global and PACKT Publishing. More information can be found on the book website and Wiki page.